Tens of thousands of science teachers in the US have recently received an unsolicited booklet titled “Why Scientists Disagree about Global Warming”, which looks like a scientific report. It was published by the Heartland Institute (self-described as a “free-market think tank”), which plans to send a copy to every public school science teacher in the nation—more than 200,000 K-12 teachers. On the bright side, this book provides an opportunity for science teachers to teach their students about fallacious reasoning, as well as common misconceptions about climate science and the deceptive talking points that today floods their social media feeds under the guise of science. Teachers can also remind students that they should evaluate the source when they read a dubious claim. In this case, for instance, the promoter of this booklet is a partisan think tank, which has campaigned to downplay threats posed by secondhand smoke, acid rain, and ozone depletion, in contradiction to scientific evidence. It is not a scientific institution with a pedagogical mission. 1. How much is the climate changing? 3. What are the effects of climate change? 4. What do scientists agree on regarding climate change? Quotes in italics are the main conclusions from the Heartland report organized by topics. Below each claim are comments from scientists actively publishing research in top-tier scientific journals. What you need to know: Earth’s surface has warmed 1°C (1.8°F) over the past century with 2014, 2015 and 2016 consecutively setting new high temperature record. Heartland report claims that global warming has stopped, in stark contradiction with reality. Under a “business as usual” scenario, global temperature are expected to warm 4 to 6°C, which would constitute a major shift for the climate. These statements are false. The IPCC has repeatedly assessed the warming due to a doubling of CO2 as between 1.5 or 2.0 °C to 4.5 °C. The warming by 2100 would be larger than this if the CO2 concentration in the atmosphere more than doubles by then. Global warming did not cease at the end of the twentieth century—the oceans, which absorb the vast majority of the additional heat trapped by greenhouse gases, have continued to warm during this time and surface temperatures have also risen, with 2014, 2015, and 2016 being the three warmest years on record. The range of warming for the “business as usual” scenario of the IPCC is 4 to 6 °C. A lower CO2 emissions scenario can lead to a warming which remains below 2 °C. There is no evidence to support the claim that global warming ceased. The observations compiled by the 3 main research groups (NOAA, NASA/GISS, UK Met Office/CRU) who provide estimates of surface global temperature all show continued warming. Natural “internal” variations occur on top of the “external” human-induced warming, leading to periods of slower warming and periods of accelerated warming. These variations are well understood by climate scientists. In the same way, Northern Hemisphere spring sees colder and warmer days (“internal” variations) superimposed onto the season’s warming due to increased “external” insolation. Human CO2 warms not only the surface but the full depth of the ocean. The natural variations exchange heat between the surface and the deeper ocean. Periods of slower surface warming correspond to periods of faster deeper ocean warming and vice-versa. Sea level height (which also reflects deeper ocean warming) has seen no slowdown, as expected from the continued CO2 emissions. Recent work has even shown an acceleration of sea level rise*. Global warming has continued uninterrupted and the last two years (2015 and 2016) are the first two to see 1°C or more of warming compared to pre-industrial temperatures. Climate models have tracked this well. Comparing the global temperature beginning at 1997 is a common trope used by some to discredit climate science. It is an intentional cherry picking of an anomalously warm year (big El Niño) to serve as the starting point. To convince yourself, start the trend at 1998, and you’ll get a much different answer. Neglecting feedbacks in this statement is seriously misleading to uninformed readers. 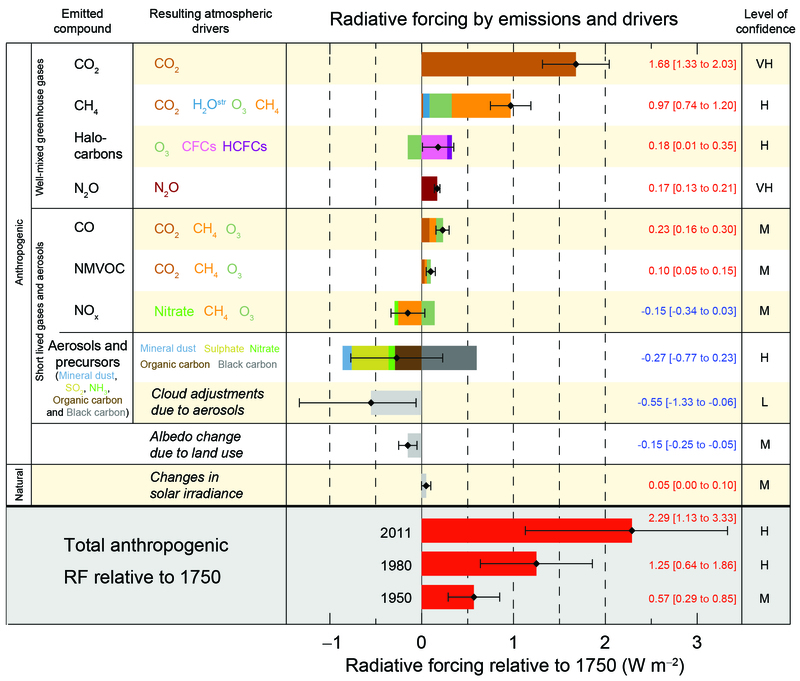 Feedbacks have been clearly identified as major amplifiers of the initial CO2-forced change. These feedbacks are explicitly resolved in climate models. The first part of the statement is true, though the numerical values are off. Without other feedbacks to amplify the planetary heating due to CO2, the expected global warming from doubling CO2 is about 1.2 to 1.3°C. See p.96 of Roe (2008)1 for a nice explanation of this. Of course, we know that there are important feedbacks in the climate system, and several of them are strong and positive, causing additional warming on top of this basic response. Narrowing down the plausible ranges of the strength of these feedbacks is an abiding goal of climate science (e.g. Stevens et al, 2016)2. Evidence has consistently pointed towards a global warming of 3°C for a doubling of CO2, albeit with uncertainty. See Armour (2017)3 for a recent study that adds to this body of evidence. So the quoted no-feedback warming of ~1 degree is completely irrelevant to Earth. It is useful only in an academic sense as a hypothetical baseline climate response that is subsequently modified by feedbacks. The second part of the statement—that half of the warming must have already occurred (presumably because CO2 levels have increased by 50% since preindustrial)—is not true. We do not expect the ultimate global warming due to doubling of CO2 to occur at the exact moment that CO2 is doubled any more than we expect water to instantaneously boil when a pot is placed on a hot stove. There is a lag between the heating due to CO2 and the surface temperature response owing to the heat capacity of the climate system, especially the ability of the ocean to take up heat. The statement that climate models overestimate the warming in response to CO2 is incorrect; it is based on either too short time periods that are dominated by natural variability, by the comparison of models with datasets that do not have global coverage, by comparing to models that were run many years ago with emissions and forcings that differed from what actually happened, by the use of oversimplified energy balance models1, or a combination of it. Recent studies have shown that once the changes in climate feedbacks over time2, datasets with full coverage are considered3 and all forcings are considered, the agreement between predicted and observed warming is excellent, even over the recent hiatus period4. It is remarkable that even projections made decades ago with climate models that were much simpler (and were running on computers that were likely slower than a mobile phone today) were quite accurate5,6,7. False. Climate Sensitivity has been assessed by the community based on recent observations and proxy data from past climates. Climate models fall within this range of sensitivity. Some recent publications point to an increase in sensitivity with warmer temperatures*. This argument reached a peak in popularity around 2012/2013 when the “hiatus” was still ongoing (i.e. 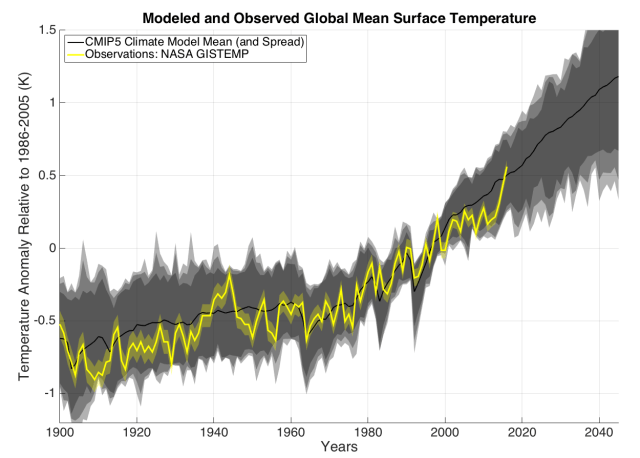 when the divergence between observed and modeled global temperature was at its largest). Even then, however, it was shown that you cannot conclude much about sensitivity to CO2 from such short-term fluctuations1. Similarly, Brown et al. (2015)2 showed that decade-long periods without warming are to be expected and that there was/is a 70% chance of seeing at least one 11-year period with no warming between the years of 1993-2050 under a “middle of the road” emissions scenario. Since then, observed warming has surged and, as of 2016, observations are warmer than the average prediction from climate models (see figures below). What you need to know: Greenhouse gases released by human activities trap infrared radiation emitted by the Earth’s surface, warming the lower atmosphere where we live. 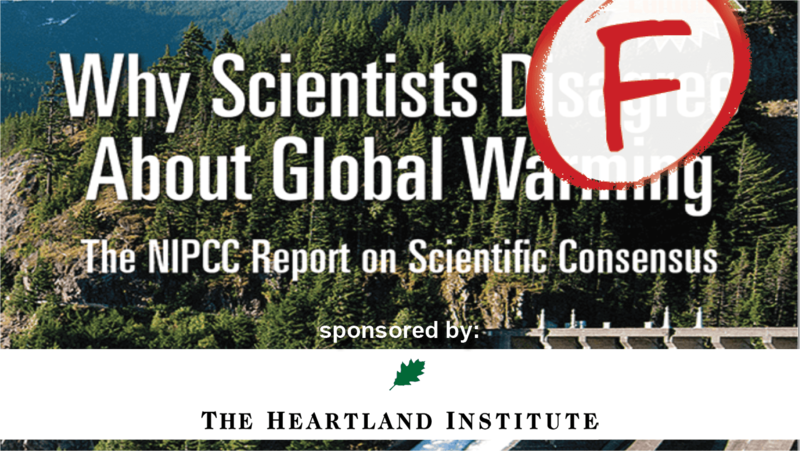 The Heartland report argues that climate is not influenced by CO2, ignoring centuries of scientific discoveries. This is both false and irrelevant. Claims that “CO2 led temperature in the past, therefore cannot have caused it to rise” originated over a decade ago from a misrepresentation of ice core research (that itself has been subject to significant refinements in dating). It was based on the fallacy that since other factors influence climate (in this case, changes in the Earth-Sun geometry) and that the carbon cycle is affected by climate, the converse cannot be true. Of course, this is not logically coherent, and in practice is wrong since the radiative effect of CO2 is well-established. Indeed, CO2 would not be expected to fluctuate on its own 100,000 year timescale on its own, independent of the climate. In fact, more recent research* shows that CO2 still led global temperatures and the full deglacial process, unlike in older literature that examined only Antarctic sites. CO2 has also “led” global temperature on geologic timescales, and is largely responsible for how Earth’s temperature evolved over the last 50 million years. There are many ways to change the partitioning of carbon between the Earth and atmosphere, and how this happens is not relevant for the fact that if more CO2 is in the atmosphere, the planet will get warmer. Today, however, the excess source of carbon to the atmosphere is from humans. This claim is flawed. Ice core records of past greenhouse gas and atmospheric temperature change1, coupled with records of ocean temperature and circulation changes2, indicate that there are complex feedbacks between earth-atmosphere-ocean changes that lead to naturally variable greenhouse gas changes. In some cases during past deglaciations, increases in CO2 have lagged methane (CH4) increases and associated atmospheric temperature rise, owing to natural processes that induce greenhouse gas release into the atmosphere. This is not the case for twentieth century and beyond human-induced atmospheric CO2 and temperature increases. Regardless of the source and cause of atmospheric CO2 increase, it will have a warming effect. Basic science does not change; CO2 is a greenhouse gas that is released into the atmosphere by burning of fossil fuels and leads to atmospheric warming. Overall this claim is misleading because you can always pick some subset of a forced warming/cooling episode and claim that the change in temperature over that particular time frame was not outside the range of natural variability. This would be like looking at a baseball player’s season in which he hit 100 home runs and claiming that nothing unusual was going on because it is possible for a typical player to hit 3-4 home runs in a single week. This is a falsely constructed argument by limiting the time range to 1979 to 2000. One can cherry pick an interval and show that it’s not especially different from the past, however if one takes the full reliable record of the last 140 years the warming is unequivocal. While there are some indicators that future solar activity might indeed be lower, this will have little effect on global temperatures. 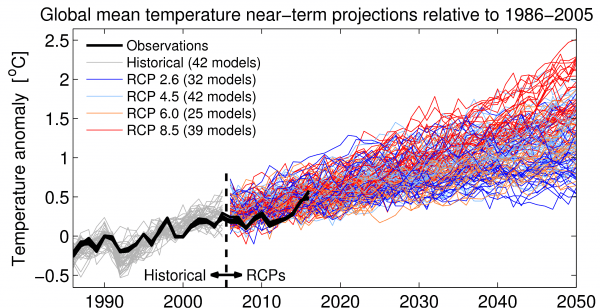 See, for example, this RealClimate post based on Feulner and Rahmstorf (2010)1. The results have been confirmed by a number of follow-up studies2-4. 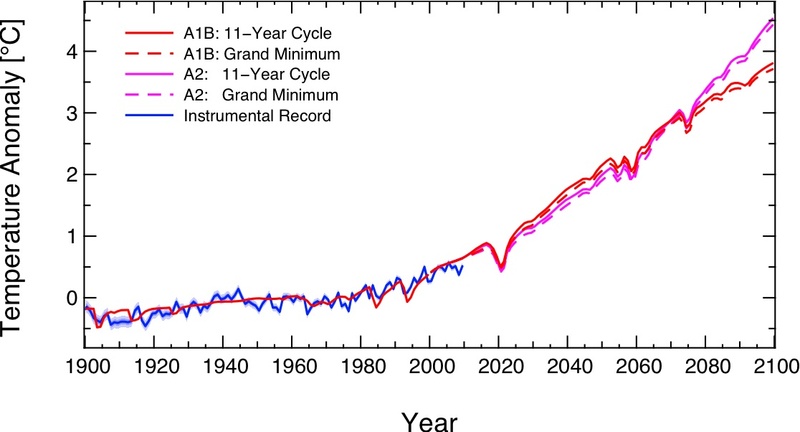 Figure – Rise of global temperature for two different emission scenarios (A1B, red, and A2, magenta). The dashed lines show the slightly reduced warming in case a Maunder-like solar minimum should occur during the 21st century. 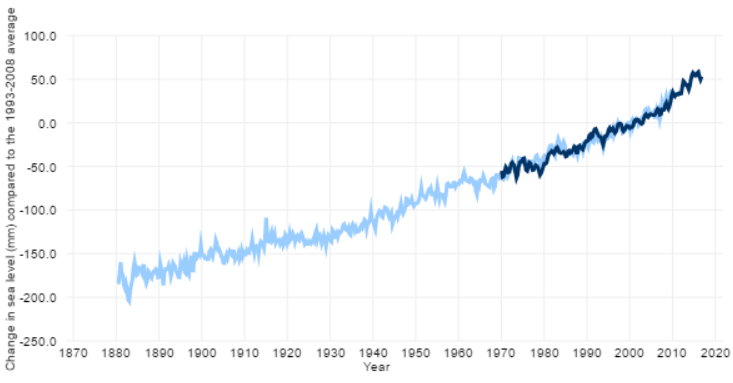 The blue line represents global temperature data. Source: PIK. What you need to know: Climate change impacts the environment, including causing sea levels to rise, Arctic sea ice and glaciers to shrink, and disrupting the water cycle. Because human civilization evolved over a period a stable climate, these changes are expected to have mostly disruptive, negative consequences on societies, notably by flooding coastal cities or disrupting water cycles on which agriculture depends. There exists a great deal of evidence to suggest that a future warming up 2°C would cause great damage to the human built environment, agriculture, and ocean ecosystems. The last time the earth warmed 2 to 3°C was the Pliocene (5.3 to 2.6 million years ago), when sea level was 25 meters higher than today. 2°C warming also means that there will be far greater frequency of record heat which is known to damage commodity crop yields. Even if climate change is taken off the table, the increase in CO2 means that the ocean become much more acidified, affecting ocean productivity and ecosystems that provide us with 20% of our dietary protein. This is not accurate. Substantial evidence suggests that certain kinds of extreme weather events (especially heat waves, droughts, and intense downpours) have already begun to occur more frequently over much of the Earth’s surface due to global warming (e.g., Diffenbaugh et al. 2017*). Further increases in extremes are likely as the Earth continues to warm, and such increases will most likely become detectable across broader geographic regions and for more event types (e.g. IPCC SREX, 2012*). I agree with Dr. Swain. Also see the Bulletin of the American Meterological Society report: Explaining Extreme Events from a Climate Perspective. There is MUCH uncertainty with regards to how extreme weather events may change in response to global climate change, and there are lively debates within the climate community about this topic. However, there is substantial evidence that extreme events are likely to increase (e.g., O’Gorman and Schneider 2009*). The vague reference to “Meteorological Science” is a strong indication that this statement has no basis in fact. This statement is misleading and vague. What kind of “extreme weather events” are the authors referring to? As others have noted, there is substantial observational evidence of increased drought and extreme temperature in recent decades, as summarized in the recent National Climate Assessment. As average temperatures rise, extreme temperature events are becoming more common, which is observable by the outpacing of record highs versus record lows in recent decades (a topic also discussed recently on climate feedback). In other words, extreme (upper-tail) events become more likely as the climatologies (average conditions) shift to warmer temperatures. Finally, what is “meteorological science” and how does it suggest the opposite? The authors provide no evidence to support the claim that a warmer world will experience milder weather patterns. This statement is an apparent attempt to confuse the issue with vague, oversimplified and contrarian statements with no explanation of the physical processes or observational evidence to support the claim. This is a mostly false statement. The correct part is the East Antarctic ice sheet is close to mass balance1, 2 and that the recent changes in Antarctic sea ice cover are explained by natural variability3, 4. The statement is definitely false for Arctic sea ice, which is decreasing dramatically since the 1990s as a response to human greenhouse gas emissions. In fact, there is a direct and linear relation between CO2 emitted and sea ice decline: each metric ton CO2 emitted leads to a 3 m2 loss of Arctic sea ice5 . The current loss of sea ice falls outside of natural variability and has been unprecedented in at least the last 1,450 years6. West Antarctic mass loss has been rapidly increasing since the 1990s2. Glacial retreat in the Amundsen Sea region, the main driver of this mass loss, appears to have started already in the early 20th century7. The rate of retreat is rapid and widespread8, with no mechanism for future stabilisation9. Current ice sheet mass loss contributes significantly (almost 40%10) to observed 21st century sea level rise. Until 2016, Arctic sea ice loss has dominated over slight Antarctic sea ice gain. In 2016 and 2017, Antarctic sea ice has been in decline as well, and reasons for this are currently under study. A recent study* suggests that as much as 60 % of the observed loss in late-summer Arctic sea ice extent could have been caused by changes in atmospheric circulation patterns – i.e., natural causes. Natural factors can only explain a part of the observed losses, and multiple studies (reviewed in the latest IPCC report) have shown that it is not possible to explain the observed losses without considering non-natural factors. False. Comparison of long tide gauge records and multi-centennial to millennial scale sea-level reconstructions from the same region indicates that the rate of rise during the instrumental period (since ~1850 CE) was significantly faster than it was during the late Holocene (the 4000–2000 years prior to ~1850 CE). The data demonstrate that an acceleration in the rate of sea-level rise occurred. This statement is false. A wide range of direct measurements (i.e. tidal gauges) and indirect measurements (i.e., gravity monitoring satellites) show that the rate of sea level rise has increased (i.e., accelerated) in recent years*. This is untrue. The best available data show that the rate of sea level rise has more than doubled in just the last decade*. Use of “accelerating” is misleading. Even if the rate wasn’t accelerating (which it is), the fact of a steady rise would still be important. 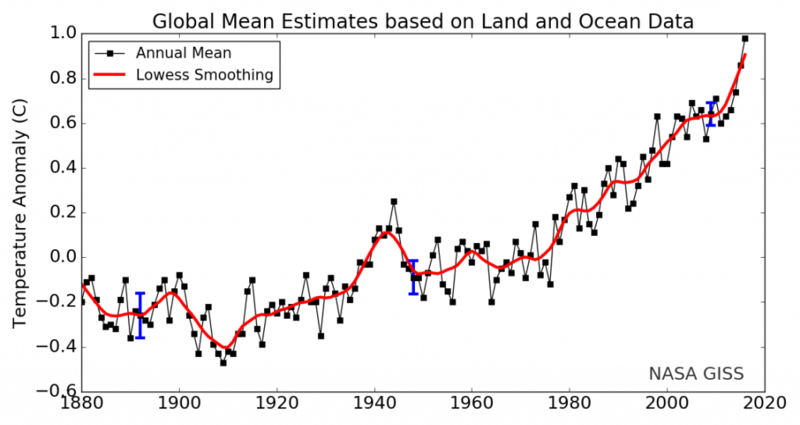 Global average sea level is unambiguously rising. Regions where sea level is falling are regions where local sea level signals are large enough to counteract the global trend—for example, in Baffin Bay and parts of Scandinavia, where continued residual land uplift is continuing, associated with the unweighting of the land from loss of last glacial maximum ice sheets. What you need to know: Existing surveys show that the overwhelming majority of scientists studying the climate system agree it is caused by human activities. To know what scientists agree on for other specific topics, check the IPCC reports that survey the existing scientific publications to produce comprehensive summaries of the state of scientific knowledge regarding the cause of climate change and its impacts on society. This is not accurate. The importance of carbon dioxide in mediating the Earth’s surface temperature via the greenhouse effect has in fact been known for well over a century (e.g., Arrhenius 1896*), and an enormous volume of scientific research over decades has demonstrated that the primary cause of observed global warming is the emission of greenhouse gases by human activities (e.g., most recently, Ribes et al. 2016*). This statement is false. The IPCC reports are written by a large number of international scientists to comprehensively summarize existing literature on climate change in the past, present, and future and its impacts on society. A complete mis-characterisation. IPCC reports survey the existing literature. 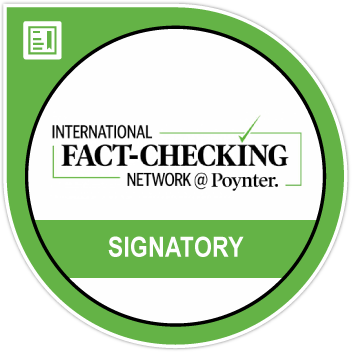 Saying the IPCC is not credible is saying the whole body of peer-reviewed literature on climate change is not credible either.